If I were to take count of all the time I have been afield calling or chasing down some type of critter, without question a good part of that time would have to be given over to searching out a variety of targets well after dark. This review starts in south central Minnesota back in the mid 1998's. It was January, and in the dead of winter, the temperature had fallen to -25 below zero, with a full moon overhead. With a fresh blanket of snow, and using a best night vision scope of the day that pulled in available ambient light, gray fox and coyotes would be the targets of a very low light environment. On the third calling stand of the night, as the sound of a wounded rabbit echoed across the valley floor, three hunters covered in white formed a triangle wedge in the upwind direction along the edge of some thinks swamp covered woods. After about three minutes of calling a hint of movement was picked up on the surface of the snowfield that was back dropped by a large rising full moon. If you're short on time and don't want to read the whole story, then I'm adding a quick comparison table for you. To get the details of each product mentioned in the comparison table scroll down to the products section. 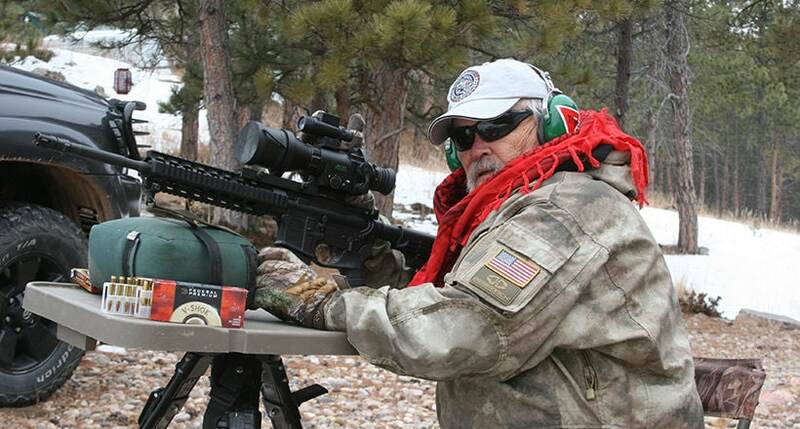 These were letter-perfect conditions for applying a new ATN generation I night sighting system to an incoming gray fox that was now heading straight down the barrel of my 12 gauge 870 Remington scattergun. 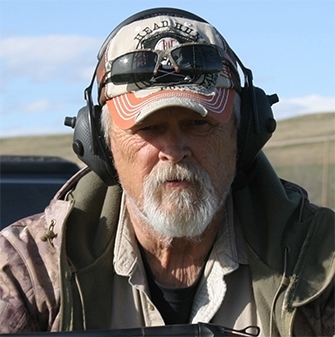 With the green-tinted view through the scope tube, and black crosshairs standing out against the quick bounding target, the night as observed through the glass sight turned a bright yellow-green with the muzzle flash of #4 buckshot leaving my shotgun. Now with a spray of fine snow and the sight of the fast-moving fox rolling across the ground, the first fur harvest of the night had been completed as a start to a long night of varmint calling and hunting ahead. 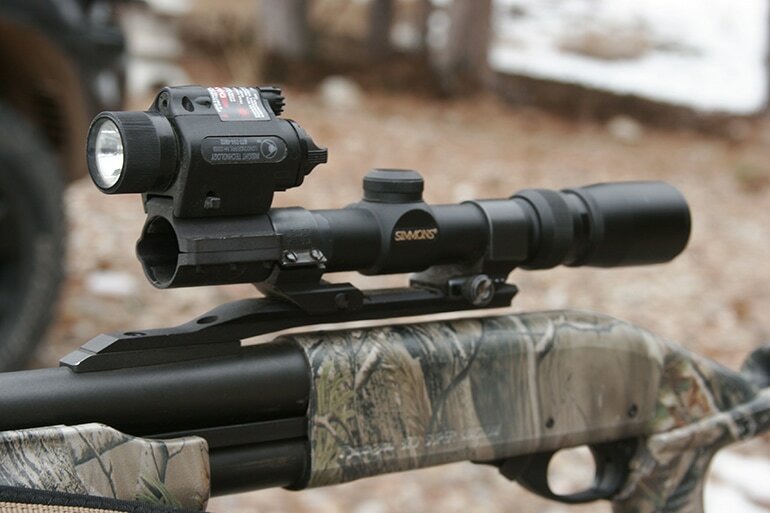 Night vision and sighting system come in a wide variety of types with varied price tags attached to them as well. During the hunt referred above, I referred to the “ Gen II” type of night sighting optical system. What I was referring to at the time was those all night vision scope system are made from the core designs of several different operating systems that are designated over periods of time in years. Very early night vision systems that were not even real scope sight for the most part were Gen I units, and some units lacking infrared tubes left the observer almost totally blind at night. 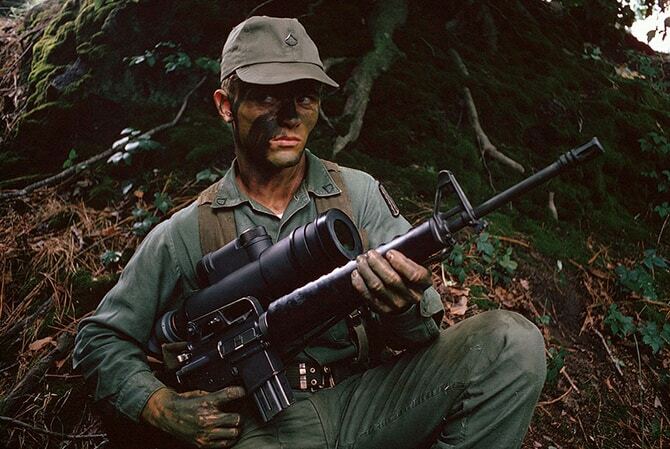 Back in the 1980's all we had were single monocular systems that lacked crosshairs and were used to confirm close range targets such as incoming dogs to bait sights, or human interdiction at a night hunting location. Target confirmations were foremost in the area of night shooting safety. Early systems as in actual scope sights were often night use only designed. Take off the protective lens caps and bring in light ( daytime ,) and you got the return of a very much out of focus image..
Today however the night hunter/shooter has all the benefits of advanced technology and these newer systems can do it all in even totally black out conditions. Starting at the top of the food chain the ATN Thor HD 640 comes up as a state of the art unit available for civilian sales. In the world of night optics, you get what you pay for, and the cost is high to be sure. Scopes can range from $500.00 to upwards of $5000.00 and change. The difference here is generation development in the night optics systems, the quality of internal parts, and intended use. Military optics are built to very strict (mil-spec) requirements and can run off the charts in terms of a cash outlay by the buyer. However, the HD 640 comes close to military quality. 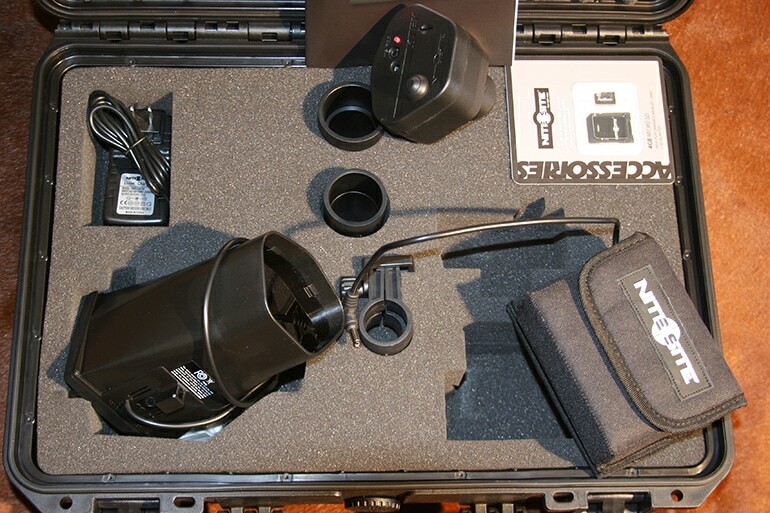 Selecting a night scope today can involve a variety of options that will again add up quickly in terms of base pricing. The HD 640 5-50X is a prime example of the current high-end thermal energy night optic with a ton of add on features. This unit has an on board ballistic calculator, smart rangefinder, zoom in target feature, recoil activated video ( RAV ) and Wi-Fi streaming ability. The systems advanced technology will allow the user to see clearly in complete darkness. The ATN Thor HD 384 Thermal system is a bit less money, but the advancements in night imaging are still very high in the technology phase of these systems. 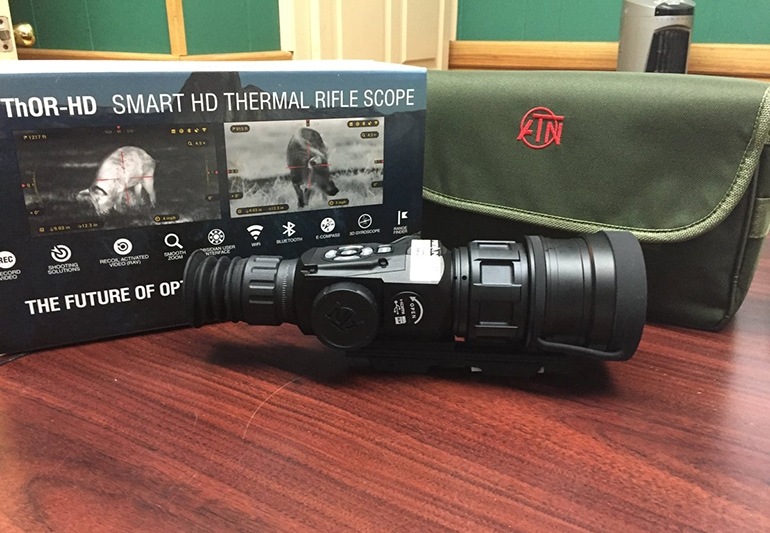 This is equipped with a smart thermal rifle scope design, high resolution video, WiFi, GPS, image stabilization and both rangefinder and calculator, this unit at medium price carries the features and quality of a much high priced unit. 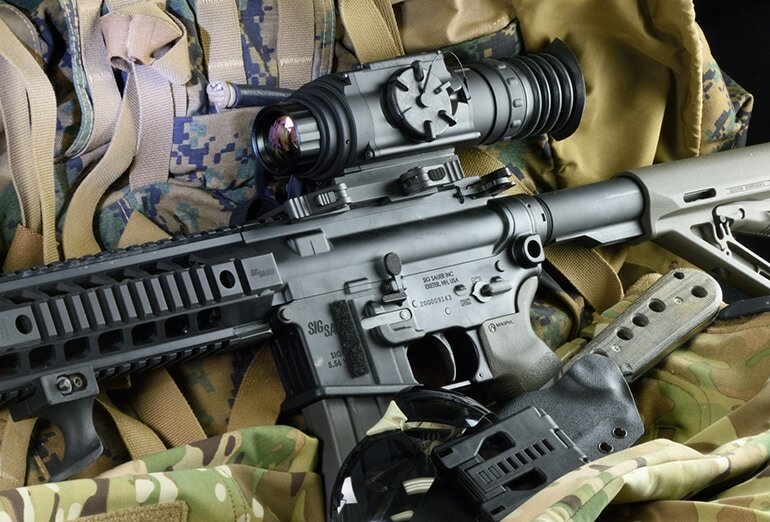 In the higher end, night sight systems the Armasight Predator 336 2-8X25 thermal imaging weapons sight using FLIR technology is to be considered by professionals or hunters that plan to spend a great deal of tie afield after dark. This weapons sight retains six on board digitally controlled reticle patterns, high end OLED display and video output, Tau-micron uncooled FLIR core technology, and more additional options. Sightmark’s Night Raider is a unit that moves down in price, and as such the buyer should not expect quality and features associated with a much more expensive unit. For the most part this system has returned solid acceptance by buyers. If your not a special operator someplace in the sandbox, or specializing in sharp shooting assignments for a police department, chances are good that a unit of this type and price range will get the job done. 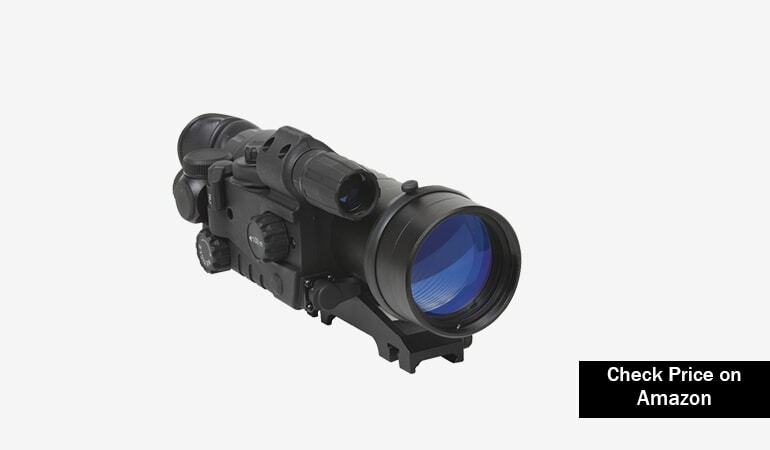 This scope features Gen 1 image intensifier tube built in IR illuminator, the detection range of 219 yards, and quick power up feature. My first operational system makes use of a high-intensity light Insight brand (M-6,) followed by a strong laser that is aligned with a low powered Simmons 3X Black Diamond turkey hunting reticle scope. 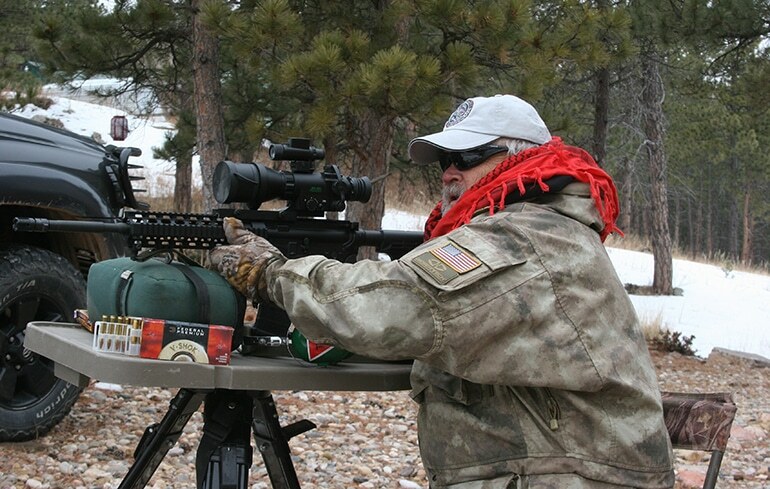 Using the scope with the good background light (on fresh snow with moonlight) or the on board flashlight and laser as observed through the scope, makes for a system that is priced under $300,00 , but meets many field needs being night hogs, coyotes, fox or raccoon. 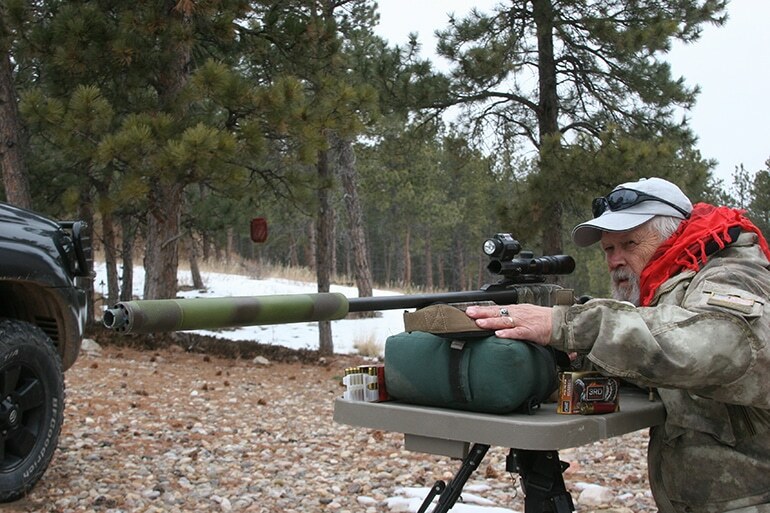 This unit is most often mounted on a 12 gauge short-barreled shotgun that is sufficiently suppressed by way of a .725 Orion by Metrogun Systems TM. While it may be a budget night sighting system it is very effective regarding the performance gained per dollar spent. Currently, several brands offer the system like this one that will cut cost but produce effective results even in the black of night. The second system is a more advanced ATN infrared designator in a Gen I operating system. 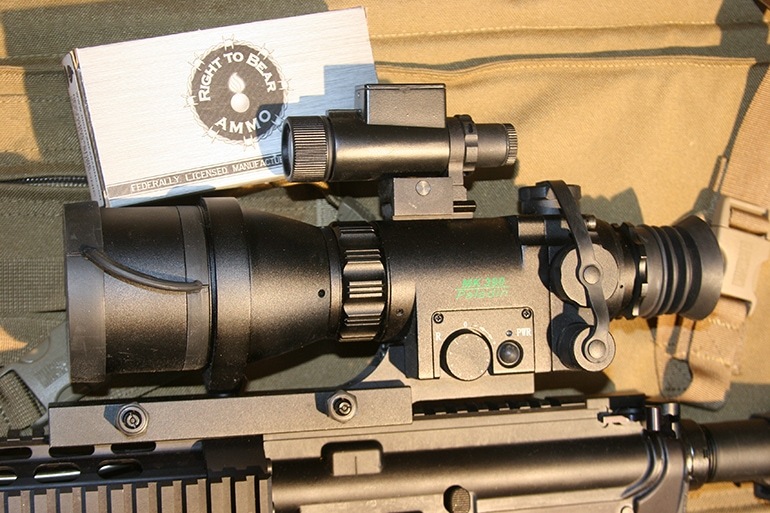 This scope can be used in full daylight with reticle cap installed, and also in total darkness. As an additional personnel system the again more advanced ATN MK 390 Paladin get the call quite often when I want to maintain total stealth. As a current new system here at Ballistics Research & Development, the British Night scope unit called NiteSite is being installed on a sniper scope for total blackout longer range varmint shooting. This system is an example of the state of the art through the scope viewing against a top-mounted video screen. What you see is what you get, and it is just point and shoot as a system. 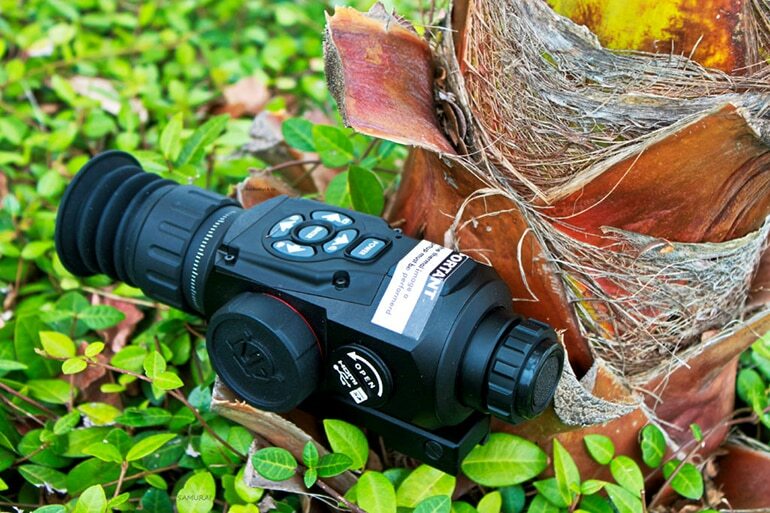 Infrared is the function system and it works much like a night functioning trail mounted game camera. Depending on just how far you want to go into night scope technology the result will vary from one unit to another. Also, the price goes up quickly as previously illustrated. The one thing I can say for a fact is that night scope systems are plentiful, and easy enough to obtain. Take that as a gift of sorts because even a few years ago this was not the case at all. Some of the most common complaints associated with night scopes are that they are not bright and don't produce sharp images. Because many of the night scope systems utilize ambient light sources ( stars, moonlight,) or background lighting off structures, the image is not going to be daylight bright at all. Green hue effects are common, and some fuzzy dots will often appear in early generation 1 some 2 systems. In the second case, thermal imaging using heat signatures off warm targets show up the image not unlike a ghost-like shape. Interviewing US Army Rangers snipers for my second book on Long Range Shooting, I ran across specialist snipers that only worked after dark almost every night outside the wire. These night hunters used M110 weapons shooting 7.52 NATO ( 308 Win ) ammo and made use of advanced heat seeking thermal imaging systems with deadly accuracy to 600 yards in total blackout conditions. 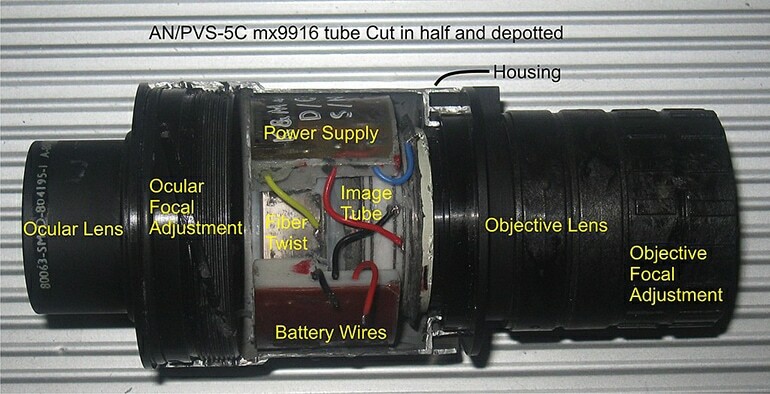 A cut-open and depotted AN/PVS-5 showing the components of a night vision device. This device was manufactured in 2nd Generation (5A to 5C) and 3rd Generation (5D) . 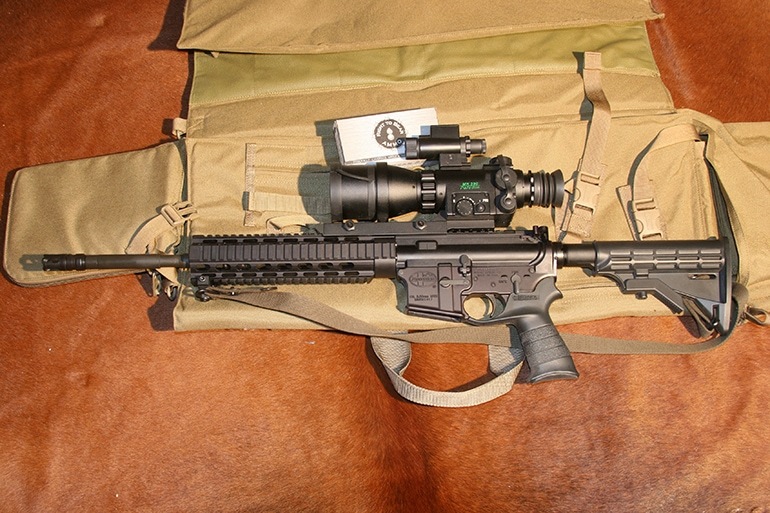 Green rifle /scope photo shows what night vision looks like in most cases. 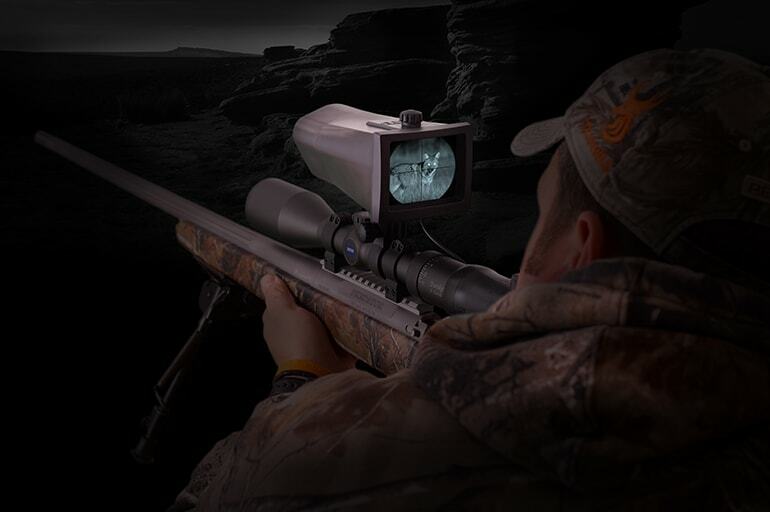 Shooters buying this system should not expect daylight field conditions when viewing a target through a night vision system. The photo of the cutaway showing the core of a night scope indicates just how complicated these systems are and must be built to withstand combat level stresses. These early Gen I systems were very basic and used available ambient starlight to operate the systems. With the advanced system today you will generate sharper black and white images, and the use of infrared and FLIR technology will also upgrade target images. All this comes at a price however and again what you get is what your willing to spend on a night optics system.